Dating app giant Tinder is rolling out more options, testing a new feature to help its users better connect – this time spontaneously and in-person. The new feature dubbed “Matches Up For” allows users to set a status of what they are interested in doing that night, and see who from their matches is available to meet. Matches Up For is intended to encourage users to connect in person. Tinder has been criticized for its “game-like” premise, and users have become frustrated with the flaky behavior of other app users. (Messaging with matches on Tinder often doesn’t lead to a date.) While Tinder still has the largest pool of singles among the many dating apps on the market, new apps are offering more relationship-focused features that encourage real-life connections, something Tinder users feel is lacking. With Tinder’s new feature, users can let potential matches know if they are free that night, and can choose from a list of activities they’d be interested in doing. Tinder is currently offering eleven choices for “Matches Up For” dates. Tinder users can choose: Going Out, Drinks, Coffee, Food, Dancing, A Party, Clubbing, Movies, Karaoke, Tea, and A Concert. According to website Venture Beat who obtained some screenshots of the new feature, Matches Up For shows the profile picture of matches who are free that night, along with a tag of the activity they’d be interested in doing. Users can can set their status or browse their matches’ status for what they could do together. You also have the option to choose a specific location. If you’re both interested in the same activity, you can message and make plans to meet. Your status lasts until midnight. This isn’t the first time an app has offered a feature to encourage more in-person connections. Dating app Happn offers a similar feature with “I’m free to…” which offers a range of choices similar to Tinder, like going for a run, grabbing a bite, getting a drink, and catching a movie. Happn matchmaking is based on people you cross paths with in real life, so the focus is on missed connections. How About We is another app that promotes more real-life connections. 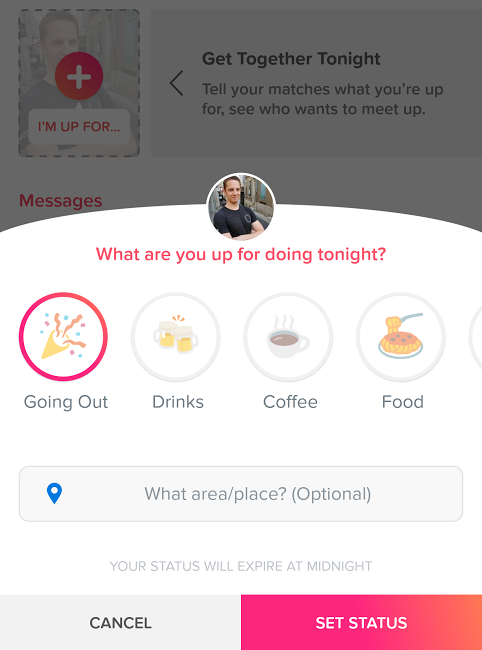 It recently relaunched, offering a service called “Tonight” (very similar to Tinder's), where users can post a date idea for a specific time and see who is available, or scroll through date ideas for other matches who are free that night. Tinder hasn’t added Matches Up For as a permanent feature yet, but is testing to see how users in specific regions like it. For more information on this dating app you can read our Tinder review.